Key to that strategy is mobilizing people who don’t vote regularly. Recent primary wins among progressive minority candidates could prove a key part of a broader electoral strategy for Democrats hoping to create a so-called "blue wave" in November, advocacy groups say. “The formula to win elections is to have high turnout and overwhelming support from communities of color and to hold a meaningful minority of whites who vote progressive,” Steve Phillips, founder of Democracy in Color, a political organization focused on what it calls the "New American Majority", told ABC News. 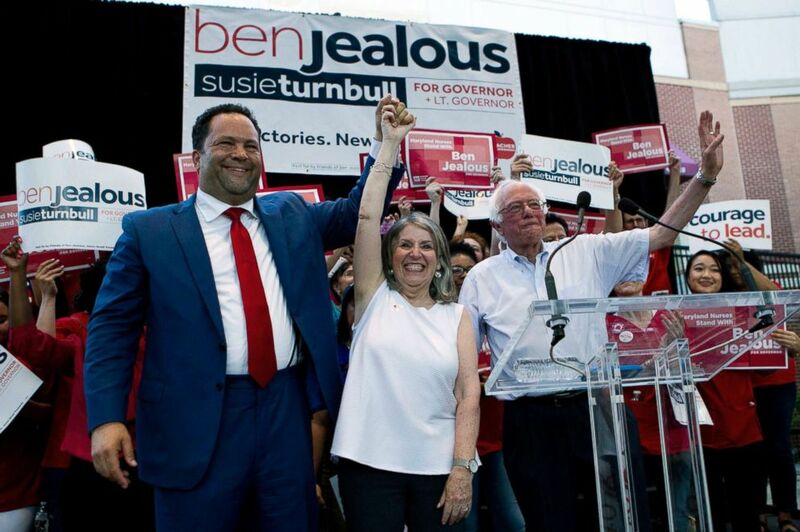 (Jose Luis Magana/AP) From left, Democrat Ben Jealous raises the hand of his running mate Susie Turnbull while Sen. Bernie Sanders waves during a gubernatorial campaign rally in Maryland's Democratic primary in downtown Silver Spring, Md., June 18, 2018. “We were successful because our coalition, like our state, has as many people of color as white people,” said Jealous, who would become Maryland’s first black governor if he wins the general election in November. Stacey Abrams, who this May was the first black woman to be a major party’s nominee for governor, explained her strategy on Tuesday on Late Night with Seth Meyers. 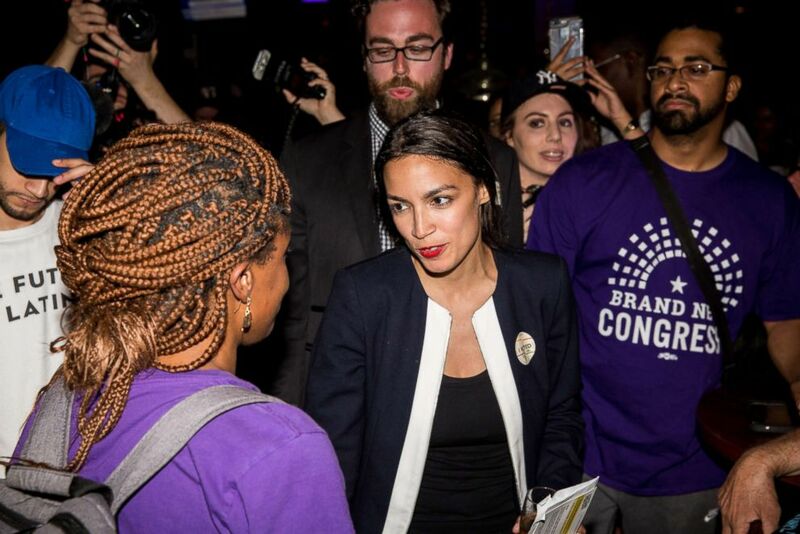 And in the Bronx on Tuesday night, in a stunning upset, Alexandria Ocasio-Cortez, 28, a member of Democratic Socialists of America, defeated incumbent Rep. Joe Crowley, campaigning on liberal priorities like Medicare for all, a federal jobs guarantee, and abolishing ICE. Ocasio-Cortez said on "The View" on Friday that America's working class is the future of the Democratic Party. “I believe that our power as a party is in organizing people -- a mass movement of people,” she said. (Scott Heins/Getty Images) Alexandria Ocasio-Cortez celebrates with supporters at a victory party in the Bronx after upsetting incumbent Democratic Representative Joseph Crowly, June 26, 2018, in New York City. Abrams, Ocasio-Cortez, Jealous and others appear to be part of a trend among minority candidates who have defeated moderate Democrats by campaigning on liberal policy priorities. Part of that strategy is recognizing the that there is often a gap between eligible Democratic voters and the margin of victory, said Phillips, author of "Brown is the New White: How the Demographic Revolution Has Created a New American Majority". In Maryland, he said, only 800,000 Democratic voters turned out for Hogan’s 2014 election, compared to about 1.1 million who turned out to elect former Governor Martin O’Malley. Those voters, Phillips and others have argued, could be swayed to turn out with a progressive agenda of economic and social justice. Jealous said that as the former president of the NAACP, he knows how to bring out voters. Like Ocasio-Cortez, he campaigned on Medicare for all, as well as free tuition at public colleges and universities in Maryland, police reform and legalizing the recreational use of marijuana. Other Democratic candidates using this strategy include David Garcia, who is running for governor in Arizona, Chardo Richardson running in Florida’s 7th Congressional District and Cori Bush, running in Missouri’s 2nd Congressional District. While candidates of color have embraced this strategy the most, Phillips said that white candidates “can and should” use it as well, citing New York’s Mayor Bill De Blasio and U.S. Rep. Sherrod Brown, D-Ohio, as examples of those who are. If the Democrats fail to more tightly hone its focus on mobilizing voters of color through grassroots organizing and a progressive appeal, Phillips said the party will not only lose elections but also permanently turn off part of its constituency. Whether or not this strategy will help Jealous win in November remains to be seen. Michael Steele, former chairman of the Republican National Committee, who was also Maryland’s first black lieutenant governor, told ABC News that this primary result was typical where voters tend to be more on the extremes of their party. “I think Governor Hogan has a superior advantage,” Steele said, adding that Hogan has been good at getting voters to see the national Republican party as different from what he has been doing in Maryland. ABC News' Lee Harris contributed to this report.